Gliding through the winter landscape with ease and grace. 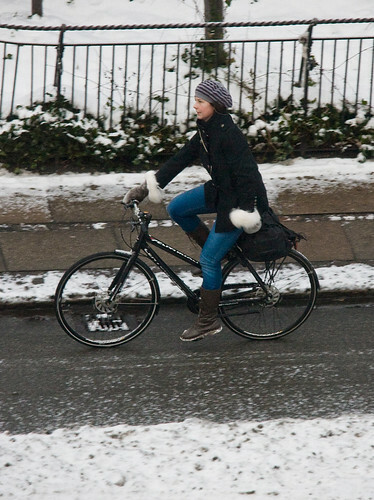 In my morning reverie I often wonder why females always seem to ride with such grace and wonderment even when you know they are freezing their tush off. Men always appear to be charging. Past the age of 5 and the wonderment is gone. Pity. News years resolution. Try to get the wonderment back. Well stated Oldfool. At least here in the USA, I think men suffer from a testosterone induced syndrome of always trying to prove themselves to others. I suspect the reason men tend to grimmace (and charge) more in the snow is we tend to underestimate the number of clothing layers the weather calls for. This has nothing to do with testosterone or wonderment. It is much more of a "looks like I wore the wrong jacket today" thing. 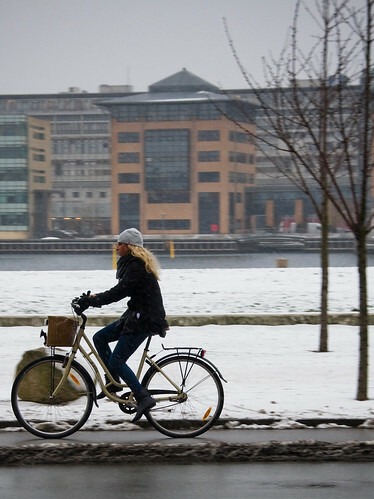 Riding in the snow in Copenhagen looks so easy. Riding in the snow in New Jersey is mostly lousy, but we do it anyway. I'm the only woman out there and the only rider who isn't a dishwasher.